Once you get started on creating your own customized designs, you will often be asked for your artwork. Your Sales Representative may ask you for Vectorized Artwork, and, if you don’t have your own graphics team or Marketing department, this could throw you into a tailspin of wonder. VECTORIZED ARTWORK is not that ELUSIVE. Vector art is basically utilizing simple mathematic equations and geometric points, lines and shapes to create CLEAN art that is camera ready. It’s most impressive quality is that it can be scaled (sized) infinitely without losing its quality. There are specific illustration software programs, like Adobe Illustrator or Corel Draw that create vectored art in a snap. No need, we can help you create your vectored art. AND, if your files have any of these extensions (.ai, .pdf, .eps and .svg.) you may already be using vectored art and not even know it! Half the programs available for graphics do this step without us. So, it’s not mandatory that you get a college degree in graphic design. Just that you recognize the term and if you have or do not have this type of file available to you with your artwork. Our customers send us a variety of art files. We have no problem guiding and responding to questions about your artwork. We can provide more information to guide you through the best way to send in your art file correctly. EVEN THOUGH THE BEST WAY TO SEND YOUR ART FILE is in the vector format (CorelDraw, Adobe Illustrator, EPS), it is not mandatory that you do so. We can also accept high resolution bitmap files like photoshop or high resolution .jpg files. It’s just important for you to know that our team can work with you. If you created an image in Adobe Illustrator or CorelDraw, you are creating a vector graphic file. However, when you create an image in a program like Photoshop, you are creating a bitmap graphic that is NOT a vectored format. 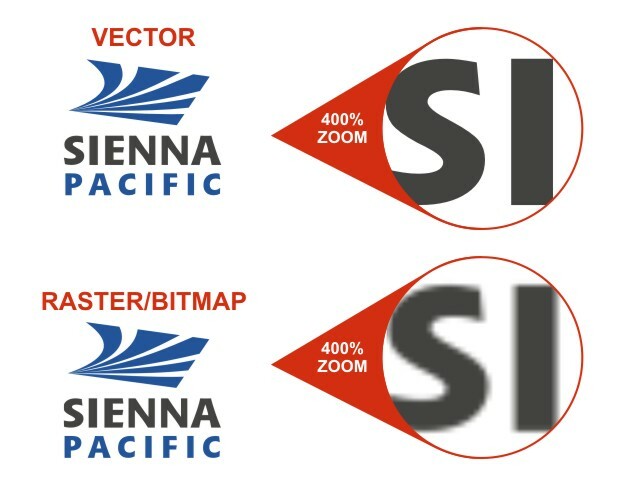 The main difference is the vector graphic will retains its crispness at any magnification, and a bitmap graphic just appears jagged when scaled up (zoomed in). IF YOU CAN’T FIND THE RIGHT ART FILE that meets our requirements, you could go back to the artist who originally created your logo design and ask for the vector file of it and/or have it emailed to us. Sometimes a graphic artist will not send you the correct design but if you paid for it to be created then you are entitled to that vector file. We know most of our customers are not graphics people: some are just starting out and some don’t even have a brand established yet: they know the name of their company and the colors and styles they like but haven’t done the full branding job just yet. IF YOU DO NOT HAVE ANY ART FILE…we can take your sketch and turn it into art very easily. No art fee will need to be charged for our graphic artist to create your logo design*. Feel free to send us a sketch or file describing what you’re looking for and we will help you out. Poor quality graphics ruin the appearance of your promotional items. You certainly wouldn’t want to spend money on custom merchandise for your business if your logo appears grainy, pixelated, and warped! Our goal is to supply you with superior quality, service and impressive lead-time that you deserve. With that in-mind please help us assist you in making your experience with us memorable one.